My brother Gord and I left Vancouver for the 1982 Formula Atlantic race at Mosport, following six weeks of building the car. We headed out in the morning, a few days before the race weekend. Well, technically we had been up past 2 AM, so it was already morning. We left a few hours later, after a full night’s sleep (my usual three hours). And did I mention that I had mononucleosis? If you’ve ever had mono or known someone who has, you know that it saps every micro-particle of your energy, and all you want to do is sleep. But I had no time for that. I had to go racing. I’d barely taken the time to go to the doctor a week earlier to get the diagnosis and a prescription that—along with lots of rest—was supposed to help me get over it in the next four to six weeks. But I had three races in that time: Mosport, then a week later at Montreal, and finally three weeks later at Mid-Ohio. The “rest” part of the healing process would just have to wait. We had to drive nonstop across Canada to make the race at Mosport, which was both good and bad news. The good news is that it meant we couldn’t spend much on food and accommodations—money that I didn’t have. Not that we were planning on staying in any fancy digs along the way. In fact, we had borrowed a tent-trailer and hitched it to the back of The Truck. That was to be our resort for the next few months. While other race teams had large exclusive tractor-trailer transporters, we had The Truck with The Tent-Trailer on the back. The bad news about going nonstop for sixty hours from Vancouver to just east of Toronto was that we had to stay awake to drive it. Gord may have done more driving than I did. I don’t know. My memories of that drive are markedly fuzzy, since I wasn’t the most coherent. I’d either be driving, desperately trying everything known to man to keep my mono-stuporous eyes open, or sound asleep in the passenger seat, dead to the world while Gord drove. So, here’s the scene: It’s early morning, and I’m at the wheel on the freeway a few hundred miles from Toronto. I had been driving for a couple of hours, my eyes barely open, fighting the glare from the rising sun. In southwest Ontario, the freeway is flat and boring, and the scenery as exciting as a Kenny G song. Gord is slumped sound asleep in the passenger seat, but I’ve got the stereo volume cranked to eleven. As we’re hurtling down the road at sixty miles per hour in our upscale contraption, I’m lapsing in and out of consciousness, trying to stay awake. I catch my head bobbing forward, and remind myself to take a drink of Coke, but a few minutes later I realize I still haven’t done so. I barely recognize that I’ve passed the exit that I’d seen coming up—the one I told myself I’d stop at for a rest. Then my eyes suddenly fly open just in time to see bright orange cones and a flashing light directly in front of me in my lane. Turns out the lights are on the back of a highway repair truck, and they’re pointing me to move into the left lane. The cones are angled across to force traffic to the left. I hit three or four as I wake up and veer over. I bet I got those highway workers’ attention. It got mine. It scared me, and that was a good thing because my adrenaline started to flow. I was now awake. For at least fifteen minutes. 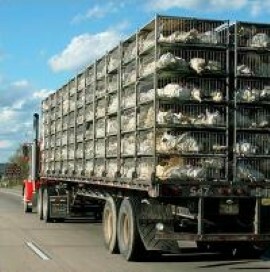 About an hour later, I start to pass one of those huge transport trucks with hundreds of cages full of live chickens. By this time I’m trying anything possible to stay awake, and I’m probably a little delirious as well. So I start talking to the chickens. Masses of these poor birds are pressed up against their metal cages, their hundreds of beady-eyed heads staring back at me as their truck roars on. Scrawny tufts of feathers now and then flitter out as I pass their truck. Nothing wrong with this, I think. After all, these chickens probably don’t get many opportunities to speak with people. In fact, it may have been the last wish of some of those birds to have a conversation with someone before heading to their deaths. I’m doing them a favor. And I think that one is actually looking at me, trying to understand. “What’s going on? Are you okay?” Gord asks groggily, stirring. My chicken conversation has woken him up and now he’s worried that I’ve truly gone over the edge. Poultry notwithstanding, we decide it’s probably time for us to trade places and for Gord to drive through the traffic of Toronto. After I nearly killed the highway workers and conversed with chickens on their way to the slaughterhouse, that may have been one of the better decisions we made that trip. Could this trip get any worse? Tune in next week to find out. Click here to go to Part 4.